Finding Joe is the title of the movie about the ground breaking philosopher, Joseph Campbell. I watched this movie on the long weekend while it was damp and chilly outdoors and received the following insights. Campbell felt that the majority of society is under a mass hypnotic trance and not living creatively. We seem to be showered with “should’s and shouldn’ts” for what is acceptable. What each of us needs to do is to dig deep into our soul and find out what makes us sing. Some of us receive wake up calls to this inner song either by a delicate nudge like a feather while others receive it by way of sledgehammer. When we are in the depths of despair, it tends to catapult us forward. Many various authorities are interviewed for their perception on Campbell’s work. Alan Cohen speaks about how Campbell discovered the framework for The Hero’s Journey. In every Hero’s Journey, there first is a feeling of seperation, which is followed by an initiation, which returns one back to where everything started. This process repeats itself over and over again as we learn the life lessons we have come to experience. We learn to keep on dying like a phoenix and rising up above the ashes. I have a quote by Joseph Campbell in my home office that I get to see every day. 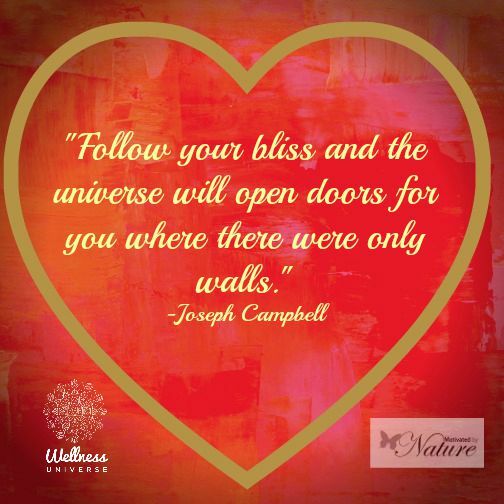 It says, “Follow your bliss and the universe will open doors for you where there were only walls.” Following your bliss is indeed an authentic journey, but it is one, that not everyone will understand. You need to ask yourself, “What am I passionate about?” The thing is that FEAR (False Evidence Appearing Real) stops many of us from pursuing our bliss because we are more concerned with what others think of us. In truth, others thoughts need to be put aside for us to fully follow our bliss. Fear will always be there but we need to move forward with courage. Courage is like a muscle and it needs to be exercised to help make it grow. Stepping out of our comfort zone grows our courage. Each and every single one of us can be heroes by accepting ourselves exactly as we are. Here is to you finding “You’ and being the hero you are. Doors are waiting to open to show the world what you are capable of. Here is to your bliss!